Lion and Dragon dance are an essential part of any traditional Chinese kung fu school. The Eagle Claw Kung Fu School Demo team can be seen performing at many different types of events, from weddings, Chinese New Year celebrations, business openings, private parties, corporate events, etc. Many of our clients book us year on year. As one of our customers you can be assured of a bright, colourful and exciting performance by our very dedicated demonstration team. 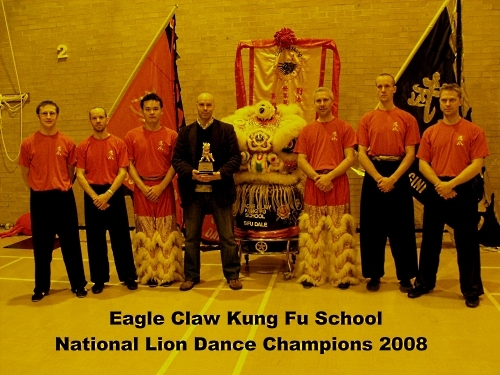 Students and members of The Eagle Claw Kung Fu School entered their first Lion Dance competition at the 2nd Annual British National Lion Dance Championships 2008, performing a traditional Fatshan Lion dance routine “The Crab” The Eagle Claw Kung Fu School Lion Dance Team placed 1st becoming National Champions in their category. Drummer, Gong player, symbol player, Lion (two people), Dai To Fut ( Happy Buddha). You can also book more than one Lion at a time (subject to availability). For larger out door performances, we bring up to 4 large school banner/flags to add to the colour and visual impact. Lions come in many different guises. Popular with Chinese Restaurants are our gold lions especially at Chinese New Year, to bring wealth and prosperity for the coming year. 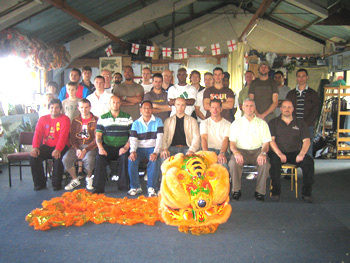 2007 Group meeting and training session to agree and set up Englands first multi association Lion and Dragon dance federation.